The global scenario of maternal health has seen an unprecedented growth, but conflict zones like Afghanistan still face a lot of challenges. Significant progress has been made but there is still a long way to go to safeguard maternal and infant health. 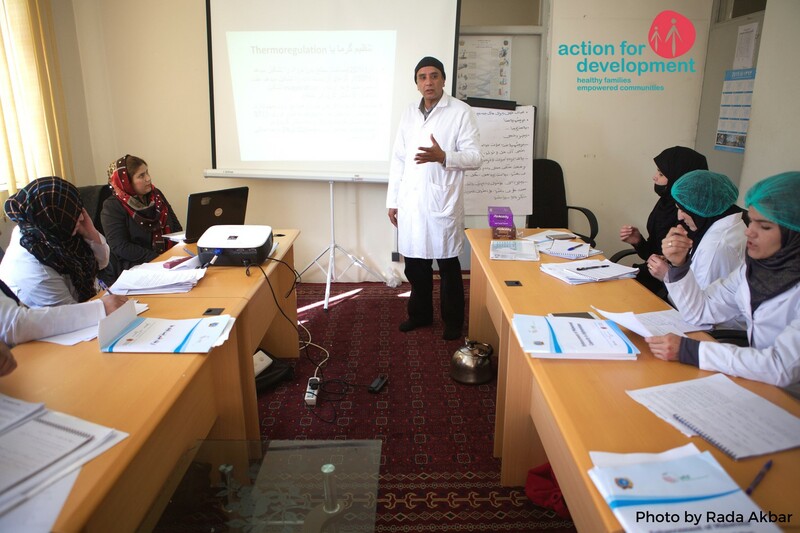 Within the context of improving maternal healthcare provision, Action for Development in collaboration with the Haute école de santé de Genève designed and developed a capacity building training course for qualified midwives in Afghanistan. The course provides two weeks of comprehensive training for midwives in order to top-up their basic training and includes 5 modules ranging from care of the newborn to post-partum haemorrhage. AfD has been significantly contributing to the professional training of certified midwives in rural areas of the country over the past 4 years. The new report by Mary Kirkbride and Olena Kuzyakiv sheds some light on the current status of the program, its unlocked achievements and vision for the future. According to the data collected, the overall project objective was partially achieved. Maternal and infant mortality rates in most of the rural areas of Afghanistan where the project was rolled-out, remained constant despite an increase in the numbers of complex cases. The majority of the project objectives were achieved. In the rolled-out areas, there was an increase of pregnant women who received ante-natal care, an increase in attended births by qualified midwives, and an improvement in the management and treatment of the most common complications during pregnancy and birth. When it comes to participant satisfaction, over 90% of midwives were satisfied with the training. All of the master trainers felt competent and confident in teaching within the curriculum. The effectiveness of the course and its implementation is one of the most important stepping stones towards the success of the program. 100% of trained midwives and master trainers felt that overall the quality of the training was sufficient. The majority of midwives, master trainers, and ministry of public health officials wish to see an increase in the duration and frequency of the trainings, as well as an expansion of the number of topics covered. A challenging aspect of the course implementation was that some rural health facilities lacked the necessary equipment and medication, had poor infrastructure and insufficient staff capacity for the training to be carried out as effectively as possible. Seeing the success of the project, training more and better-qualified midwives in Afghanistan will be the continued vision of the future. Some initial recommendations included improving the medical ethics aspect of the training, increasing frequency and duration, expanding the topics covered under the module, and ensuring financial backing in order to sustain the project. While the next steps are taking shape, it is also important to ascertain contingency risks that may follow. For instance, under-investment in healthcare which is evident in some health centres’ lack of resources and staff capacity for effective training implementation and health services. Lack of progress should be further investigated to identify and address existing stumbling blocks of project implementation. Insecurity caused by the ongoing conflict in Afghanistan has been well managed by AfD, but it remains an ongoing threat to all development projects in the country. Overall, the project has been a great success despite obstacles such as budgetary constraints and security concerns. In the end, securing funding continues to be key to ensure that the policies and programs become reality on the ground.